Mayor Kenney speaks at a gathering hosted by the Chamber of Commerce for Greater Philadelphia at the Barnes Foundation. The mayor thanked the diverse coalition Thursday that made the Philadelphia region’s bid for Amazon HQ2. Casting itself as an affordable, ethnically diverse, technologically savvy, bike-friendly haven of good food and coffee, Philadelphia marked the submission of its official bid Thursday to become Amazon's new corporate home away from home. 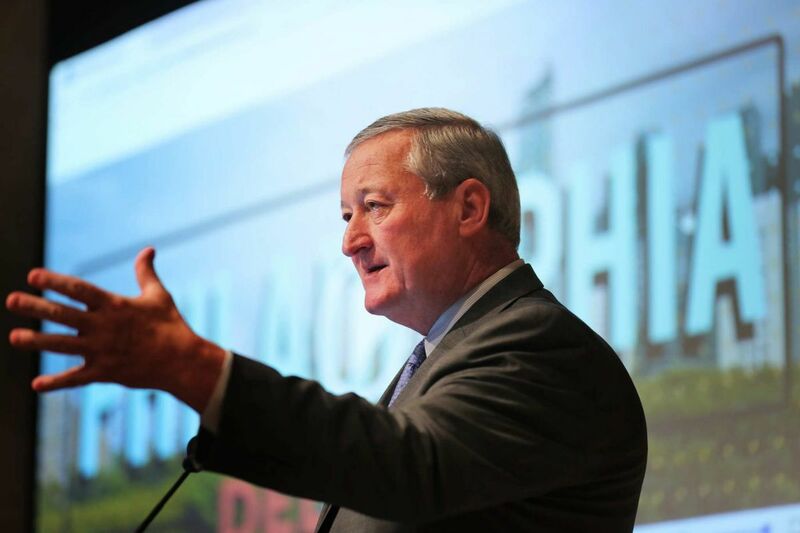 Mayor Kenney unveiled a series of promotional videos, interactive maps, and letters of endorsement that make up part of the city's bid to the e-commerce giant during a morning event at the Barnes Foundation held to recognize those who aided with the rapidly completed proposal. "We're going to win this," Kenney said in his remarks to the gathering. "But regardless, I've never been more proud of our city and our region. Everything we've done has truly stepped up to the plate." Amazon.com Inc. has said it planned to employ 50,000 skilled workers at the second headquarters campus, nicknamed HQ2. The plans, spelled out in a request for proposals issued only six weeks before Thursday's deadline for submissions, call for spending $5 billion to develop millions of square feet of office space. Nationally, Philadelphia will be vying for the headquarters against dozens, if not hundreds, of other cities, including tech-and-education powerhouse Boston; business-friendly Austin, Texas; and New York City-adjacent Newark, N.J., which is backed by $7 billion in state tax breaks; as well as a half-dozen bids from the region. Amazon has said it would make a decision next year. It plans to occupy the first 500,000 square feet of office space at the new headquarters in 2019. Philadelphia's pitch revolves around the Schuylkill Yards and uCity Square developments in West Philadelphia, and South Philadelphia's Navy Yard — sites that have been portrayed as the most promising for the Amazon campus because of their size, central locations, and single ownership. Prominent in the video portions of Philadelphia's presentation were Brigitte Daniel, executive vice president of Wilco Electronic Systems Inc., one of the nation's last remaining African American-owned cable companies; Rich Landau and Kate Jacoby, owners of the upscale vegan eatery Vedge and its more affordable spin-offs; 76ers center Joel Embiid; Thomas Jefferson University Hospital emergency room innovator Bon Ku; and a foulmouthed Todd Carmichael of La Colombe Coffee Roasters fame. Also featured were everyday Philadelphians of diverse stripes, such as the pair of young Asian men who spoke about their backgrounds. "I'm from Northeast Philadelphia," said one. "I'm from Northeast China," said the other. An interactive map included with the presentation displays central Philadelphia's bicycle lanes and Indego bike-share stations, as well as housing densities, home-price ranges, and cultural sites. "Philadelphia is in the Goldilocks zone for Amazon: Just right," Kenney said. "It has all the key ingredients that it needs to support its long-term growth … and has all the amenities Amazon's employees want, at a lower cost than other big cities." Withheld from the public presentation were specifics of financial incentives for Amazon and other business-plan details that the city deemed important to maintain confidential for competitive purposes. Pennsylvania is said to be looking at tax breaks of more than $1 billion for Amazon to choose the state for its new facility, while Philadelphia’s City Council has begun consideration of an exemption worth up to $2 billion over 10 years. While not central to Philadelphia’s chances, such incentives will be important factors for Amazon when it considers the city, given the its high business tax rates, said Jennifer Vey, a senior urban-planning fellow at the Brookings Institution in Washington. Still, she said, Philadelphia has most of what Amazon appears to want for its second headquarters location, with its large population, highly educated workforce, elite universities, proximity to other East Coast cities and to international air travel, and robust cultural life, said Vey, coauthor of a recently released study on Philadelphia’s innovation economy. The availability of large undeveloped tracts on offer at the Navy Yard and University City are also points in Philadelphia’s favor, she said. Regionally, bids were being submitted by Camden County, which has a Delaware River waterfront site in mind for the retail giant; Atlantic County; and the State of Delaware and New Castle County. Other proposals were expected from Delaware County and Chester City, which plan to offer a site on the city’s waterfront and other locations, as well as from Bensalem and Bristol Townships in Bucks County. Leaders from each of these neighboring communities have been in communication, Kenney said, and they support one another’s bids.